KOSAKA Mitsunosuke (1906-1998) is a coach (Shihan) of Kosen judo. At the age of 16, he started practicing Judo. When he was 25 years old, he became a teacher of Judo. He had taught many junior-high schools, high schools and universities. When he was 61, he became a coach at Nagoya University. Kosen judo is a style specialized in ground techniques (Newaza), so much that special rules adapted to the style had been put in place for Kosen Judo tournaments. 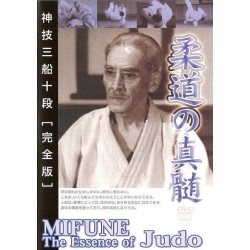 In this DVD, KOSAKA Mitsunosuke presents his Newaza techniques.